Could’nt help writing a post taking this picture to enrich our site, because it was shot in a daylife morning. City : Milan. An European city that is not only famous for the High couture fashion, but also because its citizens are getting even more conscious about problems of climate change and how can each one of us contribute just making a re- style to our lifestyles. 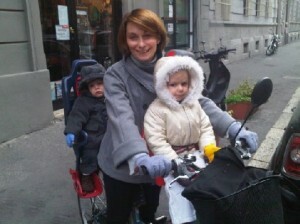 It is getting usual that people commute on bike no matter the age, the season or your job grade. 1. Find a pleasant route. It is not said that the route you do by car is the best for biking. Test the route with light traffic if possible. 2. Find a place to park your bike. get a security chain and a very secure lock. 3. Pick a simple bike. If you want to find the bike on teh place you left do no buy an expensive or fancy one. Think about a folding bike if you want to bring it inyour office or have to make short rideon bus or train. 4. Follow the rules. It is not easy that drivers respect cyclist if you do not stop in front of red lights. So ride carefully and stick to the rules. 5. Dress appropriately. If you will drive very early in the morning or at night be sure your lights works and also use a reflecting jacket.